Building a quality opt-in email mailing list of people who know, like and trust you is very important for the ongoing marketing success of your business and should be a part of your Search Marketing Integrated (SMI) strategy. Your email list becomes a distribution channel for your business, that will bring in revenue each time you send out a campaign. Whether you need to sell your products, share some big news, or tell a story, MailChimp, the world’s most popular email platform, is the perfect ESP (Email Service Provider) to easily create email campaigns that best suit your message, manage your email lists and power your email marketing across your entire online marketing activities. MailChimp provides a Forever Free account for business start-ups with up to 2,000 subscribers and 12,000 emails per month. The Growing business plan, with unlimited send capability starts from AUD$26.85 per month and scales in pricing by subscriber intervals through to advanced professional volume accounts as required. Search Group is a MailChimp Expert Agency, and is here to assist you with the set-up and configuration of MailChimp, creation of responsive HTML email templates, content and campaign creations for EDMs (Electronic Direct Marketing), provide guidance and direction for building your mailing list whilst also complying to national and international spam compliance policies. 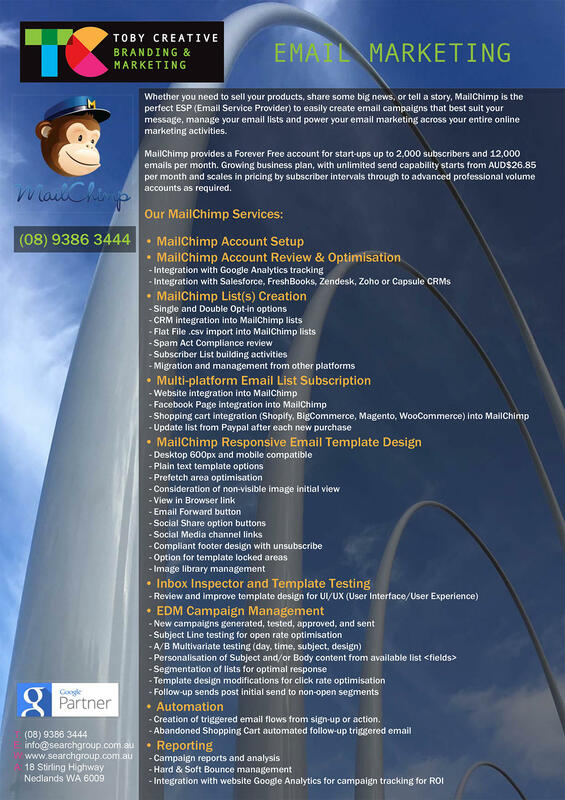 Download or print-out, our Search Group MailChimp EDM Email Marketing Setup, Management brochure, then either call us on (08) 9386 3444 to book a no obligation free initial consultation at your location so that we can discuss your specific requirements, or fill in our contact form on this page to send us your details and we’ll contact you back. Ask for our FREE website SEO report to find out the current status of your website and which areas can be improved.